Are you a digital hoarder? Or are you just extremely unorganized? You’re hardly alone. 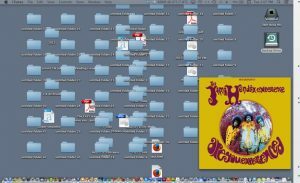 Most of us have no idea how to keep things nice and neat on our desktops – mostly we have a random jumble of files, folders and other digital debris. Yet there is a way to keep things neat, or at least not be embarrassed when somebody glances at your screen. Plus, if your desktop is weighted down with tons of files, it can slow your computer down to a crawl! So what’s the best way to keep your desktop organized? There is no “one size fits all” solution to desktop organization. Rather than be locked into an organizational philosophy that goes against the grain, design a folder hierarchy that works the way your brain does. That may involve separating work from personal, entertainment from admin, etc. But name (and organize) your folders in a way that is intuitive to you. Inside your home folder, there are a number of folders that are designed for easy access. These folders are placed in your home folder by default and are a great place to start organizing files. It’s extremely simple – you keep your photos in the Pictures folder, your music in the Music folder, etc. But beyond that, it gets a little more complex. Those five folders cover a lot of ground. For example, Family could have subfolders such as Children and School. Pending Issues could hold vacation plans, submitted health claims and current home projects. Same goes for the others – plan on populating those folders with the files (and folders) that best fit within. Good luck and have a great holiday season and an organized New Year!